The Wusthof Classic is a budget chefs knife built to be the workhorse in your kitchen. There are many things to like about this knife, starting with the design. It has a robust, yet sharp blade that can be effective cutting foods of all types and textures. If you had to choose just one knife to handle all of your needs, the Wusthof Classic Cooks Knife would do an admirable job. Perhaps the most impressive part of the Wusthof Classic is the quality of the blade. Wusthof, who makes some very expensive chef knives, used a high-carbon stainless steel that is found in blades with a much higher price tag. Not only is the blade sharp, but it’s also resistant to rust and discoloration. A big plus is that you don’t feel like you’re using a budget chefs knife when holding this blade. The handle is thick and sturdy. The full tang is a nice touch, and with three stainless steel rivets, this knife has a classic, professional appearance. For a knife with such a robust blade, it is well balanced and not too heavy. The finger-guard and front bolster create a nice balance with the heavy German steel, so it’s easy to control even for beginner chefs. The high-quality steel comprising the blade and tang are made with the same high-carbon steel used in much more expensive Wusthof models. Compared to other budget chef knives in this price range, it provides one of the sharpest, and easiest to sharpen, cutting edges. The quality feel of this knife doesn’t stop with the blade, as this knife has a comfortable, well-made handle. Thanks to the full tang, you’ll never feel like this blade is out of your control. The bolster and finger-guard balance the handle enough to make maneuvering the robust blade less of a chore. This knife is the ideal size for most everyday uses. It’s small and agile enough to make thin, precise cuts. And thanks to the beefy blade, taking on dense vegetables and thick cuts of meat won’t challenge this knife much at all. This knife doesn’t come with any sort of sheath or cover. It’s definitely sharp enough to warrant one, and they can be found pretty inexpensively at many stores or on Amazon. It’s something to note if you plan on storing this knife in a drawer rather than a block. While this knife does offer excellent sharpness, the edge itself does require routine sharpening. However, the blade can be sharpened quickly and easily, even for beginners. Wusthof Classic Cook’s Knife – The Wusthof Classic Cook’s Knife is a sturdy, well-designed budget chefs knife that can meet most of the needs required by the average chef. The thick blade and solid handle provide a feeling of quality and strength, while maintaining enough balance to be comfortable and easy to use. The result is a knife that can cut a pork chop as well as it can slice parsley. Wusthof have been diversifying their range over the last few years, so which is the better knife, the Ikon or the traditional classic and which one is best for you? Take a look at the video below to find out the differences between both models before buying anything! Wusthof Classic Cooks Knife – This is our top ranked best budget chef knife in part because it’s a bargain, retailing for less on Amazon than some of the lower rated knives in our guide. 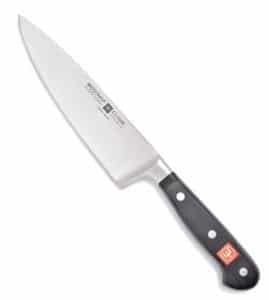 While the cost difference isn’t extreme, it’s enough to widen the gap enough to make this our top budget chefs knife.